Bestselling author Rysa Walker (Timebound) takes readers on a time-hopping adventure in this stand-alone series set in her Chronos Files world. 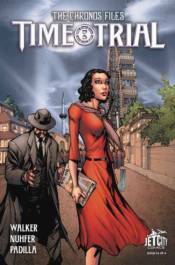 Clio Dunne must defeat a mysterious figure from her parents' past and return to her own timeline in 1931. Along the way, she will be starstruck by Clark Gable - and confront notorious serial killer H.H. Holmes at the 1893 Chicago World's Fair!